ONE + ONE + TWO. According to an article published in the SF Gate last December, the Bay Area is hemorrhaging artist. With skyrocketing housing, studio rent, and exorbitant costs of living, there's no question as to why. But some have seen opportunity through the hardship, ONE + ONE + TWO, a San Francisco based artist collective has focused on creatively mobilizing alternate forms of currency to allow artist in the Bay Area to thrive. Through pooling resources, creative problem solving and simple acts of generosity, these four recent graduates of CCA's MFA program in Studio Practice have successfully connected more than 100 artist from the Bay Area and beyond with the resources they need: workspace, exhibition opportunities, and dynamic conversation around newly created visual artwork. 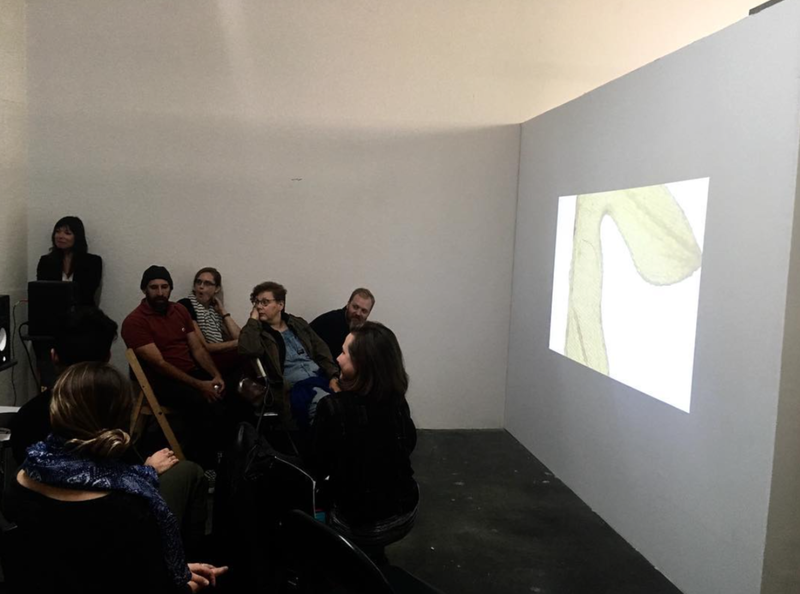 Since January 2017, the collective has hosted public programming in their collaborative studio space in the Dogpatch neighborhood of San Francisco. 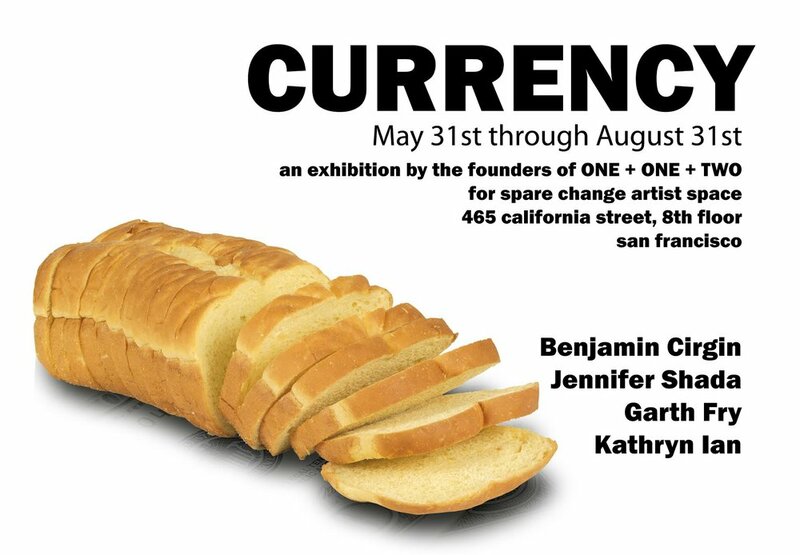 The current exhibition at Spare Change Artist Space features meditations on the meaning of currency from ONE + ONE + TWO: Benjamin Cirgin, Jennifer Shada, Garth Fry and Kathryn Ian. At San Jose Institute of Contemporary Art on Friday, March 2nd, Kathryn Ian's experimental musical project, Lux Interna, performed a three-part multimedia narrative in film + music entitled mercy entered his body as night. The narrative explored the intersections between resonance and revelation, vulnerability and vision. Situated against the backdrop of America’s own psychogeographical “dark night of the soul,” Lux Interna invited the audience to take part in a cathartic journey. The performance included Joshua Levi Ian (guitar, banjo, voice); Kathryn Ian (autoharp, hand percussion, voice); Adam Collins-Torruella (drums, percussion); and Tim Gotch (electric bass, synth). Over the course of this year, we have hosted over 100 artists and art enthusiasts and given over $6000 to artists from the Bay Area and beyond in stipends, studio space, and exhibitions. The four of us have given countless hours and tons of energy to this endeavor, and now, we need your help. In 2018, we will host one more + One Resident Artist, and we will continue to host the One + Two Critique Group on a bi-monthly basis throughout 2018. In order to make this happen, we need to raise $2000; $1000 to support the January + One Resident Artist, and $1000 to support the One + Two Critique group in 2018. Anything we raise beyond that $2000 will support additional programming. ONE + ONE + TWO has opened our third call to any artist searching for and needing space to create! 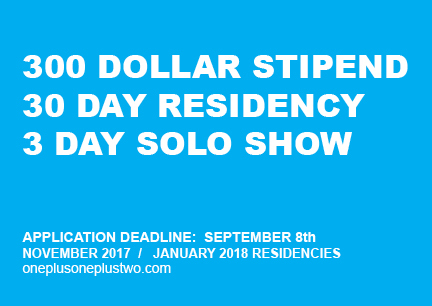 We're looking to fill our November 2017 and January 2018 residencies, so check our + ONE Residency Page now for details and tell your friends! Application deadline is September 8th! Collective Survival: Art Collectives and Artist Run Spaces creating access and power in threatening times. Emergence is an annual conference for Emerging Arts Professionals network, providing a collaborative platform for Bay Area arts and culture workers to connect, share ideas and elevate their work and voices. The theme this year is “Emergence: Whole Person, Whole Impact,” which highlights how artists participate in communities and civic engagement. This panel discussion is about the ways in which artists create their own communities via artists collectives, and how collective making is a radical position. 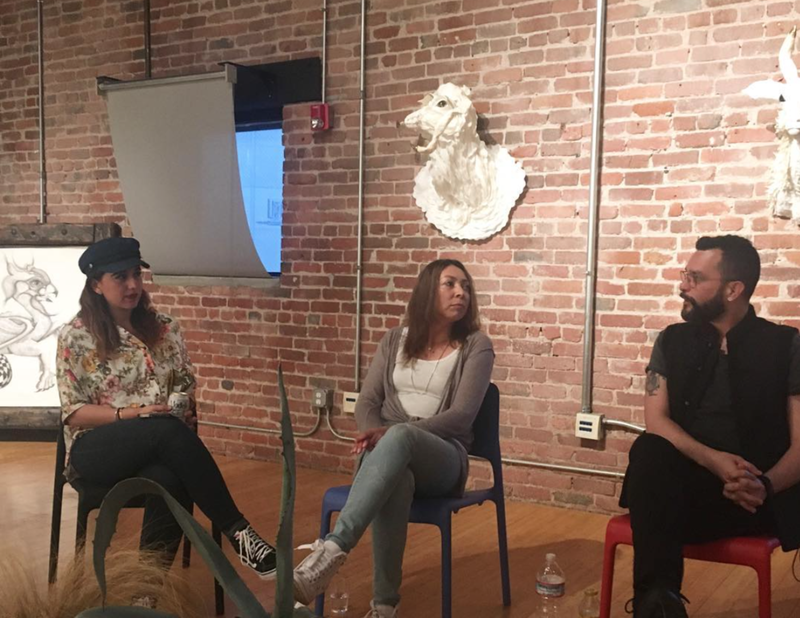 ONE + ONE + TWO's Kathryn Ian moderated the panel discussion on Artist Residencies at the SF stARTup Fair! Residency programs come in many forms, but they all serve one purpose: for artists to focus and create in a supported environment for a set period of time. Join Sharon Spain, curator and Jamil Hellu, former AIR at Recology, Holly Blake, Residency Manager at the Headlands Center for the Arts, Justin Carder from E.M. Wolfman General Interest Small Bookstore, Gwendolyn Reyes, Manager of Museum Engagement, San Jose Museum of Quilts & Textiles and Terri Loewenthal of The Chetwood as they discuss the selection process, the concentrated experience at various programs, the resulting bodies of work and career opportunities. The panel discussion streamed live on the SF stARTup Fair Facebook page - view the discussion at https://www.facebook.com/startupartfair/! 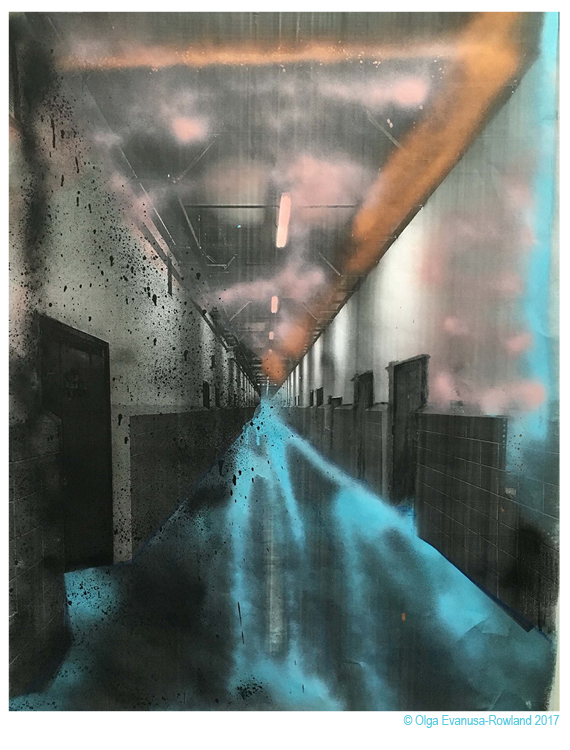 Artist residency programs offer artists incredible opportunities to create new work, they provide studio space, allow you to try new things, help you work with new materials and to cultivate new ideas. They're great for meeting and collaborating with other artists and they're just down right FUN! So, let's talk residencies with the best of em'! Join us this Sunday at the ICA, 2–4pm, for 'Residencies Within Reach' where we'll be speaking with the program managers from Headlands Center for the Arts, Little Paper Planes, The Gardens at Heather Farm, Kala Art Institute, Djerassi Resident Artists Program, ONE + ONE +TWO, San Jose Museum of Quilts & Textiles, and Montalvo Arts Center. ICA Members and students get in to this talk for FREE. Non-members $10. Join us! We have been selected as one of the presenters for Oakland Stock: A Micro-granting Dinner Series. Everyone is welcome! Diners pay a small fee ($15–$25 sliding scale,) feast on a grommet meal, listen to artists propose projects that need funding, vote on your favorite project and the winner takes the money to use towards their work! If we were to win this money, we would use it towards our + ONE Residency program. ONE + ONE + TWO has opened our second call to any artist searching for and needing space to create! We're looking to fill our July and September residencies, so check our + ONE Residency Page now for details and tell your friends! Application deadline is May 8th! We are honored and happy to announce that we have been awarded an almost full $5,000 from Southern Exposure's Alternative Exposure Grant Program, Round 10! With this money we are able to kick off our first year of public programing with the ONE + TWO Critique Group and the + ONE Residency! Thank you to Southern Exposure for this wonderful opportunity! Click Here for more info on Southern Exposure's Alternative Exposure Granting Program.